Aluminum metal is difficult to extract from its main ore called Bauxite. However, bauxite is available in India very plentifully and we have a thriving aluminium industry. 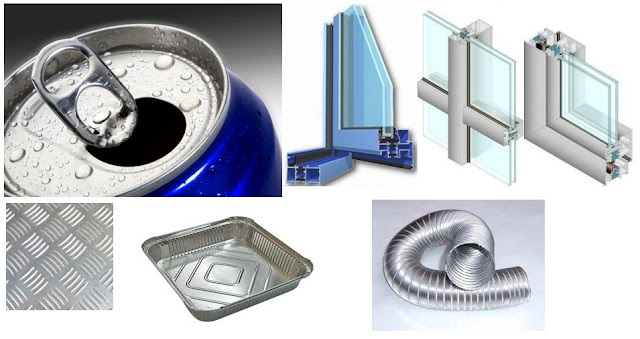 Commercially aluminium is obtained from clay in which it exist in great quantities. Bauxite is hydrated aluminium oxide generally believed to consist of mixture of monohydrate Al2O3.H2O and trihydrate Al2O3.3H2O. It is found in districts of Bihar, Madras, and Madhyapradesh. Pure aluminium has silvery color and luster, while the commercial grades show a characteristic bluish tinge. Aluminium is light in weight. Aluminium is also very corrosion resistant (because an adherent oxide layer protects it from further oxidation). It is again a very good conductor of heat and electricity (although not as good as Cu). It is ductile and malleable and is much cheaper than copper. Hence, it has all but replaced copper wires for transmission of electricity. It is also used for house-fold utensils including pressure cookers. However, since it can be converted into thin foils, it is now extensively used for beverage cans and in packaging industry. Its specific gravity is 2.7. Its melting point = 658°C, Boiling point = 2057°C. Its tensile strength varies from 95 to 157 MN/m2 . 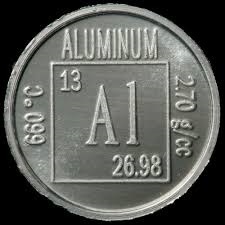 Sometime ago, in India, 1, 2, 5, 10 and 20 paisa coins were made of an aluminium-magnesium alloy. 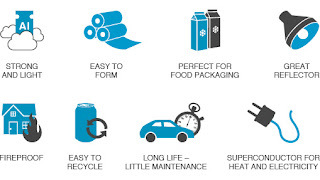 Aluminium forms a series of alloys with magnesium, which are harder and stronger than pure aluminium.